The DN-S3700’s 9” platter mounted with real vinyl is constructed with an ultra high-resolution pulse sensor mechanism to accurately reproduce the subtlest or swift scratching movements made by the human hand. The platter can perform other vital functions too such as, pitch bending, frame searching and quick file navigation from external USB devices. For added creative flexibility, three “hot starts” can be made on the fly, which also double as auto loops. In addition to auto loops, traditional A-B loops can be manually executed on the opposite side of the player. And thanks to its 5 built-in crystal clear DSP Effects, building the mood of the dance floor and remixing live has never been easier. DJs can easily activate and have full parameter control with a Dry/Wet mix control of the 5 effects: Flanger, Filter (High-Mid-Low), Echo and Echo/Loop, as well as 3 Platter Effects, including Brake (adjustable in real-time), Dump (reverse sound without losing true forward time, like a radio edit), and Reverse (plays your music backwards). For those DJ’s who perform long mix transitions and require high pitch resolution, the S3700 offers pitch control via a 100mm pitch slider with .02% for the 4% pitch range and .05% for the 10/16% pitch range. 24%/50%/100% ranges are also available. The innovative Denon DN-S3700 is a “spinning” turntable style MIDI Controller with Sound Card that gives users the advanced capability of controlling various DJ MAC/PC application software. The super-versatile and sophisticated DJ instrument lets users bring together and enjoy access to huge music libraries from virtually all-existing storage media, including Apple® iPods® and USB Flash Drives. For total flexibility, it features an illuminated Slot-In CD Player, a quick-loading and fast data reading mechanism that offers a variety of audio compact disc support, including CD, CD-R, CD-RW and CD-TEXT. Thanks to its advanced External USB Device Support, users have access to vast portable music collections stored on external USB media and may connect their iPod, Thumb Drive, and large Hard Drives for easy access to small or extensive mp3/wav libraries of up to 50,000 files. Simply plug these devices into the DN-S3700 to obtain the powerful on-board features such as, Instant Start, Seamless Looping, Effects, Scratching and easy File Searching, to name a few. Notably, with its MIDI Interface Controller (PC/MAC), the DN-S3700 is also designed to interface and control a variety of popular DJ programs that supports USB MIDI in/out interface, either by user custom mapping or direct native support by the software vendor. Users can easily control their favorite DJ software all from a single advanced compact player. Unlike most dedicated DJ midi controllers that are only USB bus powered, the DN-S3700 encompasses its own internal power supply to achieve the highest electrical specifications, resulting in best possible performance. The DN-S3700 features industry leading Burr Brown (a product of TI) 24 bit DAC processing for superior output audio fidelity. 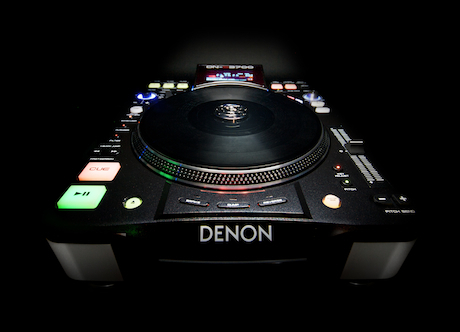 The DN-S3700 comes complete with Denon DJ’s acclaimed Music Manager Software. Among its groundbreaking features is a highly refined search system, which lets users navigate and tag edit quickly through any MP3/ WAV files connected to the system, with search criteria including Artist, Album, Title, Genre, Year, BPM and Playlists. The Music Manager will also auto calculate the BPM’s for your files as well as create the visual waveform data supported on the DN-S3700’s display. Bij ons op de markt rond april 2009 !! !